The Hopi people are a Northern Arizona Pueblo tribe who have lived on First, Second and Third Mesa for centuries. It is estimated that the Hopi village at Old Oraibi on Third Mesa has been inhabited for over 1,000 years. While Hopiland typically receives only about 7 inches of rain each year, the Hopi are excellent dry farmers. They raise blue corn which is used for ceremonial and practical purposes. While today Hopi live in government housing, mobile or other housing, many families retain their original home on the Pueblo for ceremonial purposes. Visiting First Mesa requires a permit and a guide, but it is a rewarding cultural experience. Before visiting, check the website maintained by the Hopi Cultural Center to make sure that it isn't a ceremonial day which is closed to visitors. I have used the term Kachina doll which was an Anglo interpretation of the name for reference purposes, but the actual Hopi name was Katsina and has become more widely used in the last twenty years. The Kachina doll is not easily explained because the name has several meanings. The Spirit Kachinas are religious beings who emerged from deep in the earth and revealed themselves to the Hopi people. The Spiritual Kachinas reside on the top of Mt Humphreys (part of the San Francisco Peaks) north of Flagstaff. Mt Humphreys is called The Place With the Snow on the Very Top in the Hopi language and is sacred to the Hopi. It remains a place where Hopi place feathers and other sacred objects and hold ceremonial dances to honor the Spiritual Kachinas and to ask for rain and other tribal needs. The Kachina Society is comprised of male members of the Hopi Tribe who perform religious ceremonies inside the underground Kivas and who perform religious ceremonial dances for the Hopi villages. 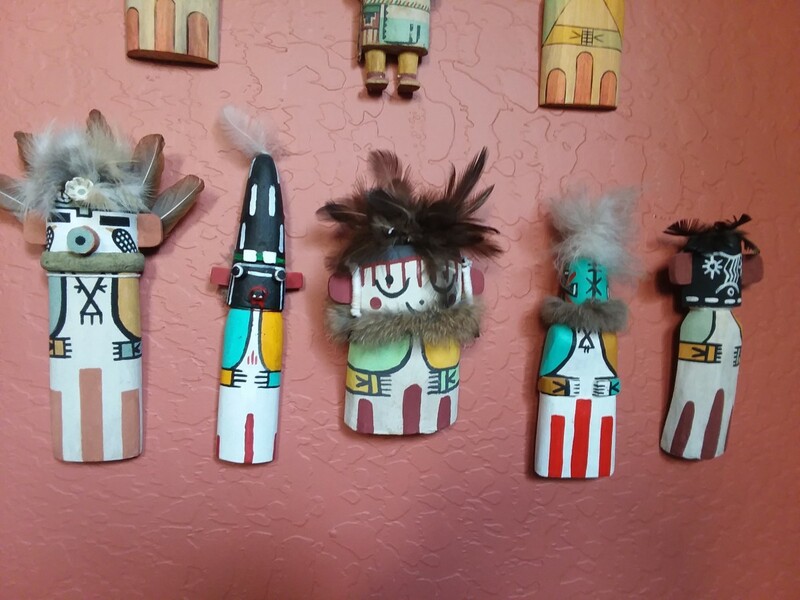 The carved Kachina dolls are representations of the Kachina Society members in their various costumes and ceremonial roles. Kachina Society members are believed to carry to prayers of the Hopi to the Spiritual Katchinas. The carved Kachina dolls have become treasured Native American ethnic art to people all over the world. 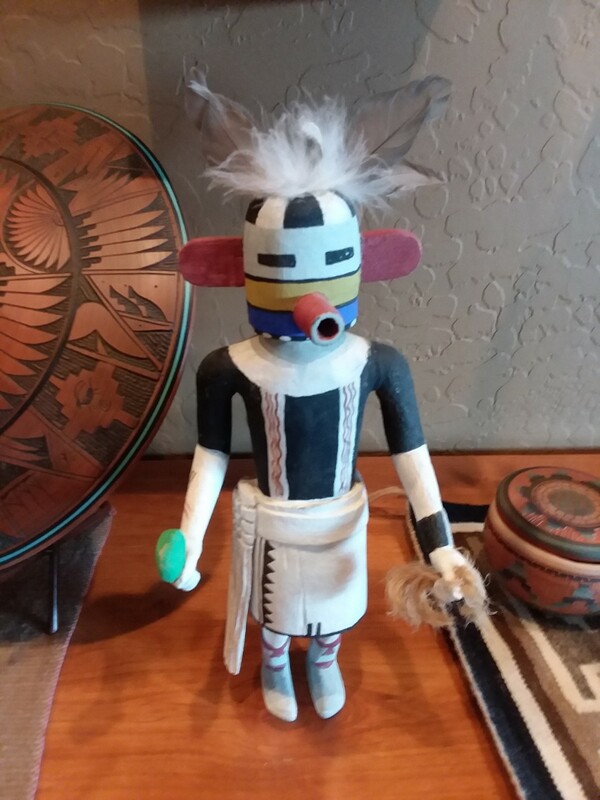 Traditional Kachinas are carved by Hopi men from the roots of the Cottonwood trees. The Cottonwood tree grows next to a source of water and its' roots have a spiritual power to grow deep to seek a source of water. Cottonwood roots have very little shrinkage. 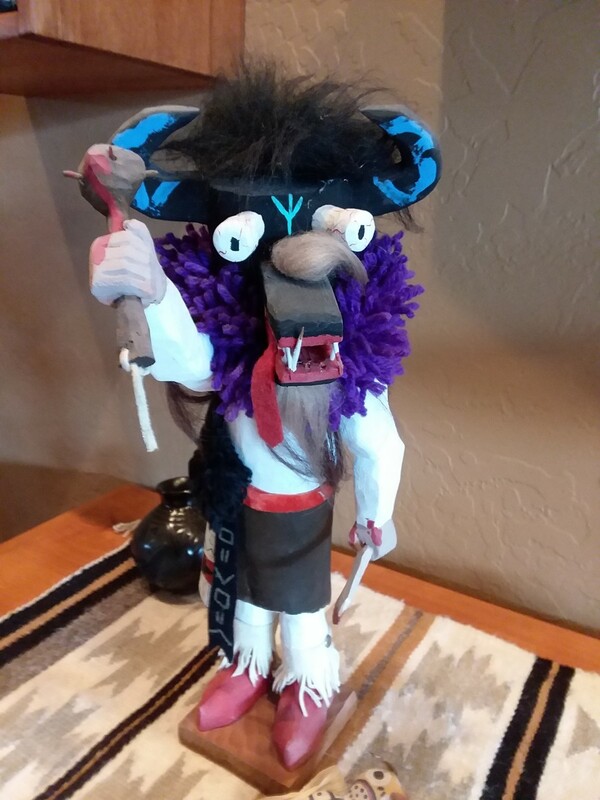 The oldest Kachinas did not have a base, but attaching them to a base has the practical functions of allowing them to stand and not break, and the added advantage of providing a place for the carver/artist to sign the piece. The most valuable Katchinas are carved from a single piece and their parts have not been glued together. Older Katchinas had aniline paints but today acrylic paints are used, and the colors used have specific meanings. Embellishments include cloth, fur, shells, feathers, yarn, leather, cotton, corn husks, beads,straw and sticks. 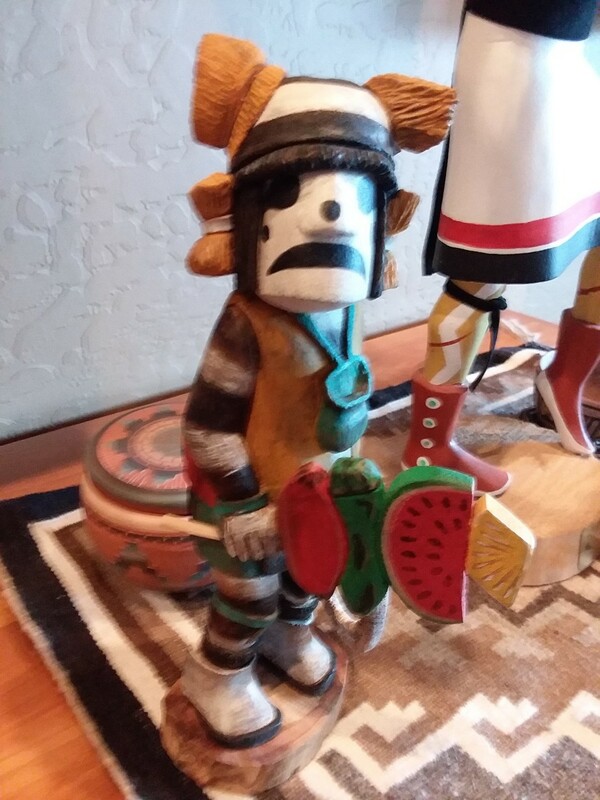 Kachinas are carved to represent animals, birds, people, plants, insects or forces of nature. The best reason to begin any collection is because it appeals to you or it has the power to evoke a special memory. Like any other collectible, some people choose to collect by the artist or a certain type, such as Hopi clowns, or a certain animal. Or maybe like most people, if one Katchina is good, maybe a couple more would be even better. Whatever the reason, there are certain things to consider. If you are looking for an authentic hand carved Katchina, choose a reputable Native American trader who has artists' profiles of the doll you are buying. Ask how long they have been in business. Unfortunately many of the Southwestern tourist shops are in the business of importing dolls that are machine made from other countries. 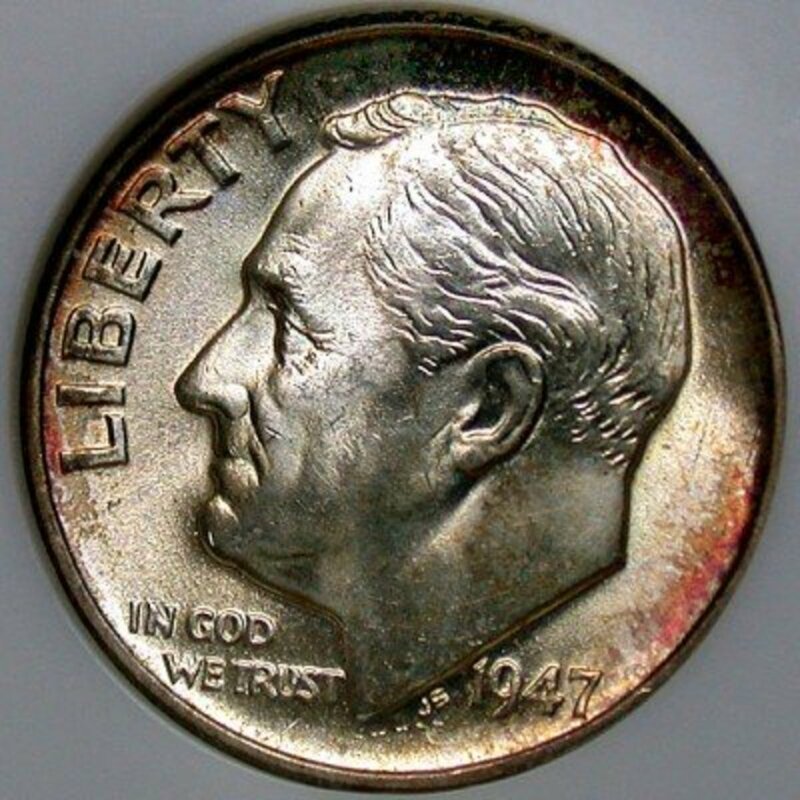 There's nothing wrong with buying an inexpensive copy of art as long as you are well aware that the object is a copy. Also, ask if the carver is Hopi or Navajo. Navajos produce Katchinas for the art trade, while to the Hopi, the dolls have a religious purpose and in general if you are interested in authentic Katchinas, consider Hopi as the Navajo people are best known for their silver jewelry and rug weaving. If the doll you are considering buying has been represented as authentic, ask if the carving is one piece or glued. Look for details. A long time ago, a dealer told me that he looks at the carving details of the hands and feet. 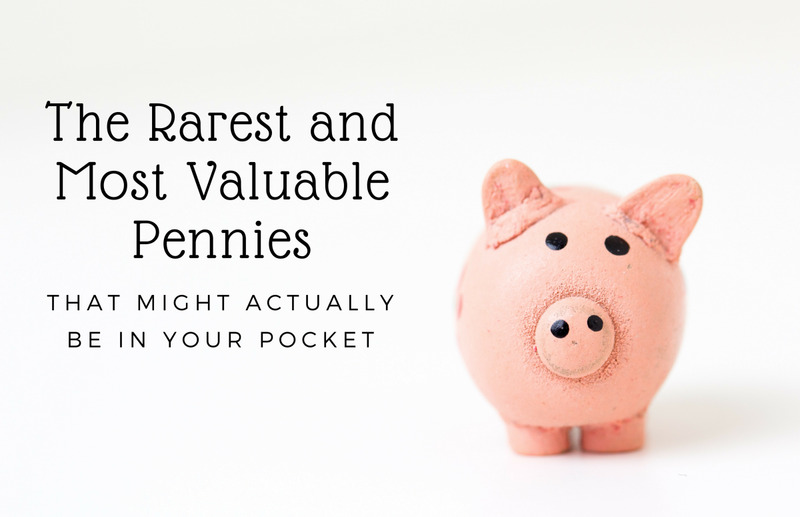 If the hands are finely carved, feet are finely carved, or the feathers are carved on the doll rather than glued, then the doll is a good investment. As a rough guide, machine made for tourist dolls are smaller and priced between $20-40. Authentic Hopi flat small cradle dolls range from $65-150. Authentic Katchinas, on a base, signed should range from $200-upward. Considerations should be given to the artist, carving detail, embellishment details, age and size of the doll. What is the meaning of owl kachina? There are several types of owl kachinas: The Great Horned, the owl woman, the screech owl, and the Spruce owl. The Great Horned Owl, spies on the clown owls and participates in the Bean Dance and the Water Serpent ceremony. Since the Hopi dances are closed to all but Hopis or special honored guests, often the meanings are kept secret. I'm glad this Hub helped you to discover them. There are a number of good books out there on Kachinas to help you see how many types and sizes there are. I've never seen these kind of dolls before, but I love them. I would be happy to give a program for your Qs Miss Marla. Lovely article. 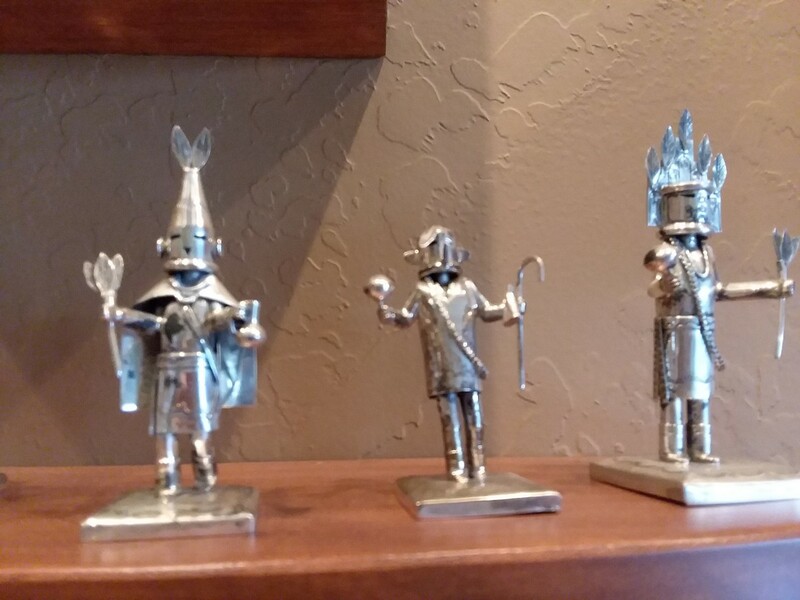 I live in Taos, NM and I am very familiar with Kachina dolls. They are also part of our Taos Pueblo culture. Your collection of them is beautiful! Very interesting article!